I wish I had the ability to write a book because I think there have always been three kinds of books I like to read and wish to write. First would be food. I’d love to take the photos and write recipes, but also write about food as a cultural effect in our lives. Second, I’d like to do travel writing. Oddly, I think this is the most realistic aspirations. Even more fun is if I mix the food in with the travel. Finally, I’d like to read a novel. I read them enough, but I would be glad to finish a long work of fiction. I have attempted to several times, but the stories don’t seem to be in me to finish. How about you? What books would you write? As you can see above, that is not Girasole, I cast on for Veera Välimäki’s Paris this weekend. 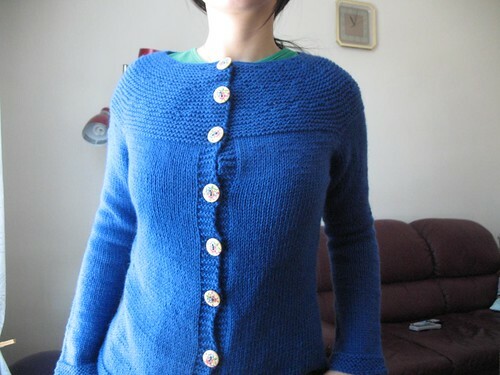 I was motivated by the Sweater Odyssey Ravelry Group’s Veera knitalong. It’s a great little group, and I had the yarn and pattern all ready for it. It is more or less a rectangle with sleeves. I really liked it when I first saw this on Veera’s projects. 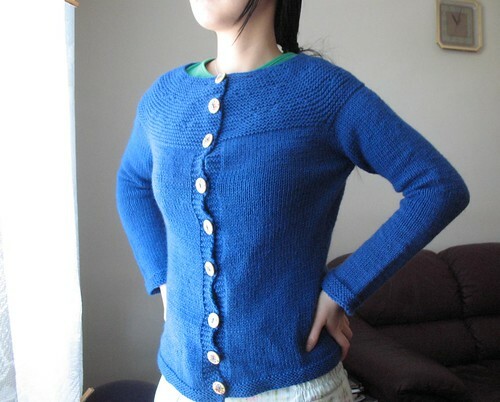 I’ve already knit five Rain Knitwear designs; she’s one of my favourite designers. The yarn is 100% baby alpaca by the Susan Andrew Collection. It is the same weight as the recommended Drops Alpaca. I do love alpaca and this one is nice and sticky. I have a knack for finding purple yarn on sale. I will not lie as I have four purple sweaters now, all from yarn on sale. Most of my projects come from discounted yarn though; I do love a bargain. Even though it is all basic stockinette, there is something soothing about its mindlessness that is allowing me to get my knitting mojo back. Must remember to keep it simple when I am trying to get out of a knitting funk. What is on yours needles today? For more WIPs, visit Tamis’s Amis. Since I read Devil’s Cub (the sequel to These Old Shades), I knew some of the characters already and the twixt that Leon is actually Leonie. I’ve always kinda like the trope of girls dressing up as boys. It’s always a good source of comedy. TV Tropes calls it Bixfauxnen. It’s usually really amusing and it was here too. I liked this more than the Black Moth because the structure of it was better than Heyer’s first novel. It was more cohesive and there was less abrupt jumps between sets of characters. As usual, I liked the secondary and supporting characters. You get a sense that amidst the comedy, abductions, and the wild plots that these characters like each other and care for one another. As for Leonie and the Duke. The latter is standard bad man in need of reform. I like that their union is about how she loves him for who he is and sees the little good in him. I do think that her worship of him was a little too much at times and she could be impertinent and rude. She made up for it by being incredibly charming by the end though and in Devil’s Cub when she matured more. This is my fourth Heyer and my third in which a kidnapping of a female happens. It’s a harsh reminder how completely without rights women were back then. Even Lady Fanny tells her husband that she is his wife and not his chattel, but apparently, this doesn’t apply to unmarried females because they tend to get kidnapped so often in these books. This was a fun Heyer novel and a good one to start off probably, but I still think I like A Civil Contract best. That was one of her later works though and I am trying to go through Heyer’s bibliography more or less chronologically. Read May 21st-27th 2012. This was my 25th book of this year. This was my first experience with Crest Whitestrips. I wanted to start off easy with the 5 minute ones and this one had decent reviews and claimed no pain. My teeth are somewhat sensitive. I use the Sensodyne Pronamel toothpaste. While my teeth are not super yellow, they do get stained easily because I drink tea. Rarely coffee and I don’t smoke. The teeth staining issue was something I’ve always remember having even before I drank tea. It is a familial trait dentists have told me so I can’t really prevent it. Funnily enough, i had less staining when I lived in London and other hard water areas, but I have grown and lived mostly in soft water areas. 5 minutes a day. I put mine on before brushing my teeth at night. I think I forgot to put them for about 6 times in the whole thing, mostly toward the end and I would only skip one day. Price: $29.99 CAD before tax, two day sale at SDM, usually around $50 otherwise. Conclusion: The box claims that the whitening is subtle. Yes, so subtle that I’m not sure if it did anything. My teeth stain easily so this was probably not strong enough, and the whole process was easy though the strips did like to slide around on my teeth at times. I’m willing to try the other ones such as the Stain Guard ones and even those which are required to be on for 30 minutes. I don’t really recommend this product unless you have super sensitive teeth and relatively ok teeth since they do not whiten that well. This was Georegette Heyer’s first novel and published in 1921 when Heyer was just 19. The novel inspires These Old Shades (which is the book I am reading after this one) which will set off Devil’s Cub and An Infamous Army. which I guess would be appropriate for the time. The antagonists in this novel are fairly annoying, but they all seemed to be redeemed by the end. Even Tracy’s kidnappings are somewhat swept under a rug. The best part of the novels were around Jack, Diana, Miss Betty and the O’Haras. Miss Betty steals almost every scene she is in. Diana was described as having “a tragic mouth that belied a usually cheerful disposition, and hinted at a tendency to look on the gloomy side of life”. If only I could have written like that at 17! While Heyer is not super literary or luminary in some ways, there is talent in writing characters, plots and stories with such appeal and seeming ease. The biggest issue I had with this novel was actually the lack of page time for the above characters. Why was there so much time spent on secondary characters and not the main romance? I liked Diana, but I didn’t think the viewer read enough of her as a heroine. There was a lack of character and relationship development there. Too much on the antagonists and the periphery characters, unless they were suppose to be the protagonists? In any case, the most winsome characters had the least amount of attention in this book. Still, an engaging first novel for any writer and enjoyable Heyer as usual. No, I don’t have any pets. I would like to use names from books. I think children’s books or young adult books have the more imaginative names such as Harry Potter, Winnie the Pooh, etc. Dickens has some interesting names too but not necessarily for pets. I don’t think I know many people with book-based names though I haven’t heard many tell me why they their parents named them such and such. How about you? Do you have any good literary names for pets or people? Since the last time I posted a WIP Wednesday, I finished the Garter Yoke Cardigan on April 18th, but I didn’t block it for another three weeks due to weather. This weekend, I finally put the buttons on it and I did a very bad job of it. I became a bit fed up with the cardigan. I haven’t knit anything since I finished it except a demi hexipuff. I’ve lost a lot of knitting mojo. This one month lack of knitting can be blamed on a few things so I am slowly getting back to knitting with my next project. Girasole by Jared Flood. Mr Flood is one of my favourite knitwear designers I think. Like him, I like tweed, rustic wool, heathers, cables, and lace on thick wool. When I saw Girasole, I wanted to make it because I had a wonderful time making the Hemlock Ring Blanket a few years ago. I am using Lion Brand’s Fisherman’s Wool. I couldn’t afford to use the Eco for such a project. Yes, I am knitting a giant wool doily blanket in the summer. I’ve had the yarn for awhile and the pattern for even longer. Secondly, I can take my time with this since it seems I have not been too interested in anything lately. This could be a good way to bring my mojo back. Finally, since it is summer, I can block and dry this outside in the sun! It’s for the best because I can’t imagine waiting for this thing to dry indoors in the winter. Wish me luck, everyone. What is on your needles this week? See more WIPs Wednesday at Tamis’s Amis. It’s a long weekend so yay for me as I have one day less of class this week. Also, I managed to finish my homework on time on Friday so have had time to do personal chores and today, I do some reading! I started Georgette Heyer’s books last month and requested a bunch of them from the library. I haven’t made a dent in the pile at all, but I will do so today. It’ll be Heyer marathon for awhile there. In other news, I am still trying to explore social media. I have been trying to use Twitter again (@athena), but I am failing. I am not sure why, but I don’t really find it easy to tweet. I am addicted to Pinterest though. I was invited in late 2010 when the site was still somewhat new. It has much more content now and as a result, much more addictive. It appeals to the crafter, decorator and stylist in me. There are some seriously nice book shelves on that site. The weather will be hot today at 30C so I am going to run an errand before noon and be back to read. Ahh that’s the stuff. This is a difficult question since I do read books which are realistic and fantastical. When I was a child, I wanted to be Wendy in Peter Pan and Lucy in Lion, the Witch in the Wardrobe. I also really liked the idea of having a daemon in the His Dark Materials trilogy. Though the problem with fantasy-adventure books is how dangerous they are for the characters. Also, I read a lot of historical fiction, but if anyone ever asks me if I would go back in time, I still wouldn’t know what era to choose. All things in the past had their good (clothing, chivalry, food) and bad (lack of women’s rights, lack of toilet paper). For example, I really like Pride and Prejudice and most people seem lovely in it, but I can’t imagine wanting to live as a Regency woman. Alright, I think it’s best to stick with the children’s books so Harry Potter post-Voldemort and the world of the Winnie the Pooh. The Maladjusted is an anthology of short stories by new writer Derek Hayes. I don’t read a lot of short stories, but I average at least a couple of these kind of books a year. I like the format, but I prefer novels since I like to get invested in the characters and follow them along. A good short story usually hooks you in quickly to be attached. There isn’t much time to drag out your indifference. I found most of the stories in this book fairly interesting. The settings usually had a good amount of detail. The author is based in Toronto and many of the stories are set in the city. While I have not lived in Toronto, I’ve been there and know many people from there. The stories do capture the sense of the city, its people, and a certain Canadian urbanity. “A Feel for America” set in Taipei, and “Shallowness”. I like travel stories so I liked the details in those set abroad. Hayes has an attention for smell which is interesting as well. All in all, I’ll be interested if the author writes a full length novel since I think the writing shows promise. I recommend this for Torontonians and other urban Canadians especially. Disclaimer: This book was sent to me by the author. I was not paid for this post and all views expressed are mine alone and not influenced by the author or publisher. For more on my review policy, please see and contact me here.